A passenger on an Air New Zealand flight thought she was "going to die" when the plane suffered severe turbulence over the South Island. Mother-of-four Jo Giles said the trip from Wellington to Christchurch on Flight NZ5031 last Sunday was "like being in a plane crash movie". Passengers were drenched in hot coffee and tea as the ATR72, operated by Air NZ subsidiary Mount Cook Airlines, suddenly dropped in altitude, she said. "Everyone was screaming and clutching their seats. I believed I was going to die when the plane plunged from the sky." Giles said the plane was "cruising along nicely" when the first drop came. "The crew had just done the hot drinks round. I looked at one lady seated across from me. It was like it was in slow motion, the coffee left the cup, shot up to the ceiling and landed all over her. "I looked around and everybody was covered in coffee. And then the next drop came. I shot up as far as my seatbelt would allow. I could hear kids crying in between screaming. It was truly terrifying, I've never experienced anything so scary". 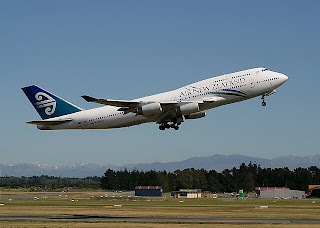 An Air NZ spokeswoman said the aircraft experienced 15-20 seconds of severe turbulence about halfway down the East Coast of the South Island. Turbulence was not unusual on that flightpath because of unique weather patterns created by the Kaikoura Ranges and the aircraft maintained its course. "There was definitely no dramatic plunge at any time. In this instance, as a gesture of goodwill, we did offer dry cleaning vouchers to any passengers who may have been affected by beverages that were spilled during turbulence."